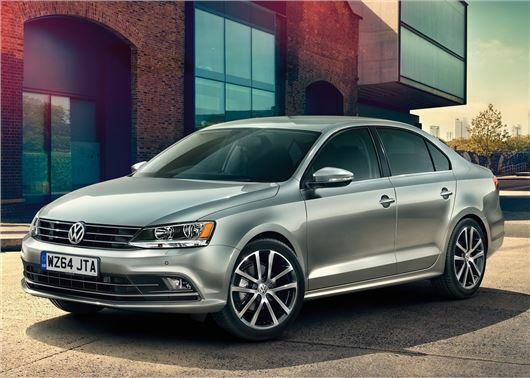 The facelifted Volkswagen Jetta is now on sale, with updated styling and improved engines. Prices start at £18,815 for the entry level 1.4-litre petrol and £20,095 for the 2.0-litre diesel. The revised Jetta will reach UK showrooms in December. The Jetta gets a number of styling updates, with a revised radiator grille, bumpers and boot lid. The redesign of the boot incorporates an aerodynamically efficient lip, which extends into the wings at the side. According to Volkswagen, the changes improve the Jetta’s aerodynamic footprint by 10 per cent. Inside, the changes are minor, but the Jetta does get new fabrics, a redesigned steering wheel and the option of ambient lighting. Three trim levels are available - S, SE and GT - and standard equipment on base models include DAB radio, electronic stability control, electric windows and air conditioning. SE trim adds 16-inch ‘Atlanta’ alloy wheels, Bluetooth, cruise control and leather trimmed multifunction steering wheel, while the range topping GT gets sports suspension, 17-inch ‘Lancaster’ alloy wheels, front fog lights, sports seats, ambient interior lighting and colour multifunction trip computer. The engine line-up features two diesels and two petrols, with improved economy across the range. The entry level 1.4-petrol now has 125PS and returns a claimed 52.3mpg and 125 g/km of CO2. The 1.6-litre diesel has been scrapped in favour of the 110PS 2.0-litre diesel, which offers 70.6mpg and 105g/km of CO2. The 1.4-litre petrol can be uprated to 150PS in SE and GT trims, returning a claimed 53.3mpg and 123g/km of CO2. A 150PS diesel is also available, with 67.3mpg and 109g/km of CO2. A six-speed manual is fitted as standard across the range, but a seven-speed DSG is available for £1425. The Jetta also comes with new optional assistance systems, including Blind Spot Detection with Rear Traffic Alert.